When you decided to build your new home, there is no doubt you considered your child or future child(ren), their needs and all their STUFF when choosing a house plan. No matter what their age, kids have all the furniture adults have. They also have plenty of extras like toys, game systems, sporting equipment, stuffed animals, arts and craft supplies, and all those special treasures they stash in the closet and under the bed. You probably know it is important to maximize each child’s space in your new home, so when shopping for furniture keep this rule in mind: If it’s not practical, don’t buy it. 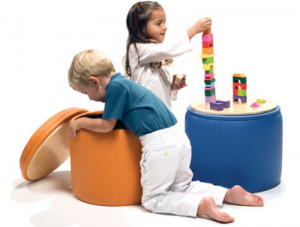 Consider these space savers when buying furniture and accessories for your child’s new room. Multi-Purpose Furniture – Multi-purpose furniture should be attractive, functional and satisfy more than one need. Toy boxes and hinged ottomans are ideal space savers because they offer out-of-sight storage and a place to sit. Desks with drawers offer storage for school and craft supplies and a work surface for writing and working. Finally, consider pieces of furniture that will grow with your child and make a smart financial purchase. Loft Bed – For older children, a loft bed is a great way to expand usable space while maintaining floor space. A loft bed is similar to a bunk bed because it sits up off the floor. But instead of having a lower bunk, there is room for something else like a play area or a study space. Many loft beds come with built in shelving units, dresser drawers or a desk underneath the bed. Convertible Crib/Bed – Consider purchasing a convertible crib if you are expecting a baby or have an infant or toddler. Convertible cribs grow with your child from infancy through their teens and beyond depending on your/their preferences as they grow. These kinds of beds convert from a crib to a toddler bed and then to a day bed, twin or full size bed depending on the brand and style. Usually the conversions are easy and only require adding or removing side boards, the foot board, or rails and swapping out the crib/toddler mattress for a twin/full size mattress. Most furniture stores and baby stores sell these kinds of beds and they are usually available with matching furniture pieces such as dresser, night stand, changing table etc. Purchasing a convertible crib or bed saves space because you won’t have to buy new furniture as you child progresses though life. This also means you won’t need to find a place to store the old stuff until you can use it again or find another use for it. Under-the-Bed Storage – Free up closet, shelf and floor space with organizers that fit under the bed. There is a wide variety of storage containers, bins and boxes available all designed to neatly slide underneath a bed. Using various totes to store out of season clothing and bedding under the bed keeps it out of the closet when it isn’t needed and keeps it out of sight. You might even consider giving your child one organizer of their own to store their “special things”. Shelving – Both bookshelves or wall shelves are a necessity for saving space. Rather than having piles of toys, books, games and collectibles on the floor, shelving provides a place to organize, store or display your child’s favorite things while keeping the floor space clear for walking or playing. Wall Pegs or Hooks – It is no secret that children typically leave things on the floor. Free up floor space and teach your child to take care of his or her belongings by installing several wall pegs or hooks near the bedroom door. This will give your child a place to put all their personal items such as jackets, backpacks, hats, belts, coats and more. This will free up floor space keeping your child from stepping on his hoodie or ball cap and keep him organized. If he get into a habit of always hanging his things at the door, he’ll know right where to find things when he needs them. Take some time to consider which of these space savers will work in your child’s room.